Walgreens has pulled a brand of pain and itch cream from its shelves over a potential poisoning risk to young children. 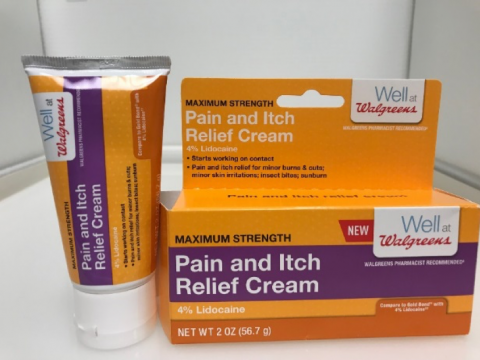 The Pain and Itch Relief Cream is labeled with Walgreens house label, Well at Walgreens. The recall was issued on Jan. 30, although there’s no indication of the recall on the Walgreens website. The company’s Facebook and Twitter pages have also not noted the recall. About 74,000 units of the cream were sold before the recall, according to the U.S. Consumer Product Safety Commission. “The packaging is not child-resistant as required by the Poison Prevention Packaging Act. The pain and itch relief cream contains lidocaine, posing a risk of poisoning to young children,” the agency stated. The recall affects the creams that say “Maximum Strength,” “Pain and Itch Relief Cream 4% Lidocaine” and “NET WT 2 OZ (56.7 grams)” printed in white on the front. The packaging contains the UPC barcode 3 11917 18962 8 on the back. The manufacturer is Natureplex, a company based out of Olive Branch, Massachusetts. Anyone with the cream should safely secure it out of reach of children. They can return it to Walgreens at the soonest possible time for a full refund. No incidents or injuries stemming from the poisoning risk have been reported. Anyone with questions can call Natureplex from Monday to Friday from 9 a.m. to 5 p.m. CT. The U.S. Consumer Product Safety Commission is charged with protecting the public from unreasonable risks of injury or death associated with the use of thousands of types of consumer products under the agency’s jurisdiction, according to its website.